This is the praise-the-poems section of the evening. We're going to welcome into the poetry sphere, Jill Jones' latest book - published by Ralph Wessman at Tasmania's Walleah Press. 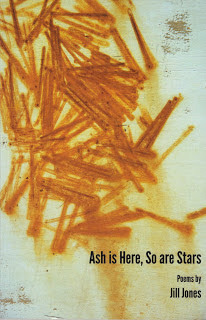 It's called Ash is Here, So are Stars and, regarding the cover, it looks like there could be some rust as well. The cover image is Annette Willis' photograph of macro-rust in Marrickville. On her dot com page Jill says her poems are "fragmented, flagrant, floating - perhaps an abstract or ruined lyric, where ‘I’ has shifted from the centre." She says she has "a continuing interest in texture, pattern and transience, of jumping in the midst of the flow, experience in language underway, asking questions about how the pieces don’t fit as shards alter meanings." She continues "While not getting hung up on ‘the image’ as such, I’ve always worked visually. I’m not interested in telling images what to do but rather a process of seeing. The soundings of a poem are also important to me, as is the way the line works. I prefer more linguistic play in the line emphasising both connectedness and parataxis, the flexing of thought/meditation and critique, including self-critique." Phew. That kind of covers everything. I think perhaps that makes me redundant for this task. What should I say? Usually when I make these speechettes I try to explicate the poems for you so that you'll be interested in reading the book and, of course, so that the poet gets some kind of rewarding warmly glowing feedback, but Jill's said most of it herself in those little extracts from her web page. There's a Jo Burnsian line in the same poem - 'what's the point of/sadness among tax cuts' and later in another poem there's the Burnsian alliteration in 'legal action, legislative lugubrosities'. On the back cover, I mention 'projective poetry' that began in the 1950s in the US. The Black Mountain poets used what they called 'open field' composition to replace traditional closed poetic forms with an improvised form that should reflect exactly the content of the poem. And the content was one perception directly followed by another perception. The form was based on the line, and each line was to be a unit of breath and of utterance. Jill relates very many instances of breath and breathing in these poems, but now I think that perhaps their effect is to draw attention to projective verse rather than practise it; they are "about" breath rather than its application. to the tune of a trice bawdy ballad as exchange. 'lyke' is spelled 'l-Y-ke' - which brings me to mention the use of archaic (sometimes arcane) words - in 'Southern' - 'grizzling bairns naught in pocket a little/nickel maybe the brass gone into glass' to describe a poor childhood, a drunken father - it's like rewritten Dickens. Some reclamation is going on too - 'among the bane/written on the window','it frets and comes fullest 'til it breasts/yes, you know how it breaches anew though/it's old' ; there is yoghurt that is 'yawed', and so on. Jill's multiplicity of approaches are unbounded. There is variety in the shorter standalone poems and then there's 'My Fugitive Votive' - a sequence of experimental sonnets and a long fragmentary poem, 'Where we Live', closes the book. Rust acts to slowly alter and transform and disappear. Sometimes there's a nonsense poem like 'Brilliant Slippy Works' that seems kind of 'Edward Learesque". It's a poem about theft. Jill Jones' poems don't arrive fully located or grounded, they are instead anticipating possibilities - everything is potential and in an abstract kind of state. It's through obliquity that the poems seem to desire an un-knowing; to unlearn, to find a kind of relief from the weight of contemporary poetics and from centuries of tradition. Mostly, things here are tangential. Return to Extras - selected writings or Pam Brown's web site.